Beauveria Bassiana is a fungus which causes a disease known as the white muscadine disease in insects. 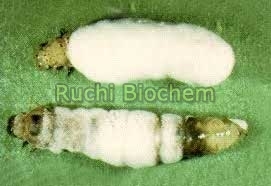 When spores of fungus Beauveria Bassiana come in contact with the cuticle (skin) of susceptible insects, they germinate and grow directly through the cuticle to the inner body of their host. The Beauveria Bassiana fungus proliferates throughout the insectâ��s body, producing toxins and draining the insect of nutrients, eventually killing it. Therefore, unlike bacterial and viral pathogens of insects, Beauveria and other fungal pathogens infect the insect with contact and do not need to be consumed by their host to cause infection. Once the fungus has killed itâ��s host, it grows back out through the softer portions of the cuticle, covering the insect with a layer of white fungi(hence the name white muscadine disease). This downy mold produces millions of new infective spores that are released to the environment. 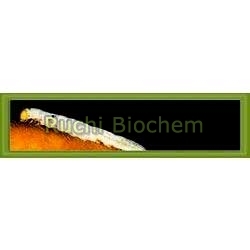 Beauveria is a naturally occurring fungus in soils throughout the world, and has been researched for control and management of soil borne insects. Many soil insects, however, may have a natural tolerance to this pathogen, which is not exhibited in many foliar pests. 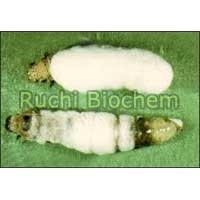 Therefore, commercial development of this fungus for biological control has primarily been targeted against foliar feeding pests. Current commercial formulations are limited to those produced by few companies:The spores of the foliar formulations of fungus are microscopic, can be applied with standard spray equipment. It can also be used as a dip for cuttings, and for soil applications - landscape and containers. Beauveria products should not be tank-mixed with fungicides. Fungicides should not be applied within 24 hours of Beauveria applications. (An exception maybe copper hydroxide.) Beauveria products are compatible with a number of adjuvants and chemical and biological insecticides. But, as Beauveria products contain live organisms, some chemicals may have detrimental effects, and growers should contact the specific manufacturer or dealer for specific recommendations. Imidacloprid appears to synergize the activity of Beauveria for several pest insects.